Whether you woke with neck pain this morning or have been suffering with neck pain for many years chiropractic can help. Chiropractic techniques are ideally suited to the treatment of neck pain through the use of adjustments, manipulation, muscle stretching, soft tissue work and exercises. Many of us spend a significant amount of time sitting and working in front of the computer. This often leads to postural problems giving rise to muscle tension and increased pressure on the joints of the neck and shoulders. In more chronic cases this can lead to ‘referred’ pain causing numbness and tingling into the arms and hands. 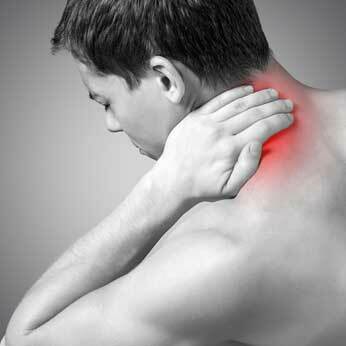 Occasionally neck pain will arise from a traumatic injury such as a fall or car accident. In such cases neck pain can sometimes still be felt many months after the accident. So whether you’ve suffered with neck pain for many years or just a few days, make an appointment today by calling 01372 383 050. There are many different structures within the neck that can cause restricted movement and pain. Below are just a few of the issues we commonly see at the clinic. The facet joints are joints that allow the spine to move in different directions. 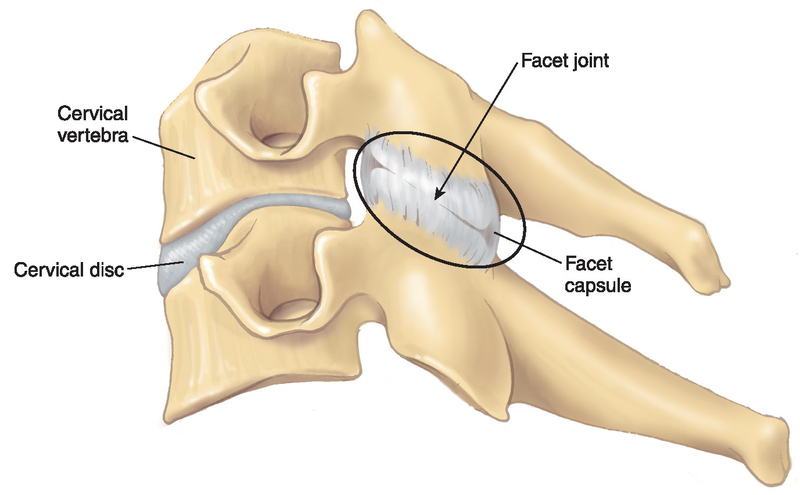 These joints have opposing surfaces of cartilage and a surrounding capsule that is filled with synovial fluid that reduces the friction between the joint surfaces. If the joints become stiff then the spine can longer move freely causing inflammation and irritation to the localised nerves; this can cause referred pain into the arms. Neck pain from a cervical facet sprain is a very common condition that we see on a regular basis and can easily be remedied with chiropractic treatment. In some cases the cervical facet joints will become worn and exhibit ‘wear and tear’ referred to as osteoarthritis (OA). Even though chiropractic treatment cannot remove the arthritis it can significantly help to restore movement to the facet joints and decrease the pain you experience. Patients who have a significant amount of OA will often benefit from regular care to ensure that their symptoms do not return. Cervical disc injuries are relatively uncommon but can cause significant pain and disability. The main features are neck pain, arm pain – often with numbness, pins and needles and a feeling of weakness. In milder cases chiropractic treatment is appropriate but in moderate to severe cases an MRI scan will be required and potential onward referral to an orthopaedic or neurosurgeon for further evaluation. This is a condition where the muscles that control neck movement go into sustained involuntarily contraction. Depending on which muscles are involved these contractions can cause the neck to be pulled into awkward and painful positions that can rightly cause the patient a high degree of concern. There are a variety of classifications of torticollis that affect different age groups such as infant congenital torticollis and adult onset idiopathic torticollis. The cause of these conditions is not fully understood. However, at the clinic we have successfully treated many adults with torticollis through the use of massage, muscle stretching, cervical manipulation and exercises.